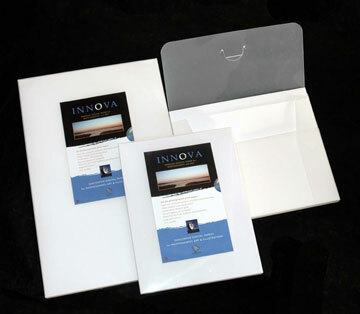 Innova Art digital fine art papers are all fully archival and are pH neutral, acid and lignin free. They are made from the highest quality alpha cellulose and / or fine cotton linters. Our papers have been extensively tested for UV resistance and longevity on the Blue Wool scale as specified by the Fine Art Trade Guild in the UK. We are currently running tests at FOGRA in Europe. If you would like to see the test certificate for a certain paper and machine set up, please contact us. The purpose of the Guild Print Standards is to protect the interests of consumers and maintain confidence in the art and framing industry. Artists, publishers and fine art printers are encouraged to promote their high production standards and the integrity of their limited editions. * Lightfastness of finished print - results of 6 or more on the Blue Wool Scale in all areas of the print - or its equivalent under empirical test conditions. * Minimum weight of substrate of 250gsm. Measures and calibrates the permanence of prints. Two identical test prints are created. A calibrated blue wool test strip is masked (1/2). The strip and one test print are placed under xenon lamps in accordance with the test standards. The other print is stored in the dark as a control. At various times, the test print is compared to the control print. When visible fading is evident the wool test strip is examined. The amount of fading is then measured by comparison to the original color and a rating between 0 and 8 is awarded. Zero denotes extremely poor colour fastness while an Eight rating is deemed not to have altered from the original and thus credited as being lightfast and permanent. Blue Wool 6 is the excepted standard for limited edition prints. The objective of Fogra [Fogra Graphic Technology Research Association] is to promote print engineering and its future-oriented technologies in the fields of research, development and application, and to enable the printing industry to utilize the results of this activity. Innova Art are currently running tests at Fogra, results will be posted soon. Look on-line to compare the performance of different inkjet papers with the new interactive Digital Sample Book developed by the world-famous Rochester Institute of Technology (RIT), USA. 'The written descriptions provided by manufacturers and suppliers can't convey the particular qualities of all the inkjet papers that are on the market. More coherent and dynamic visual tools are needed,' says research scientist James Boatright of RIT. The Digital Sample Book at www.digitalsamplebook.com allows the viewer to properly analyse papers on-line, viewing the paper surface, tone, texture and sheen from different perspectives, lighting angles and magnifications. 'It's the next best thing to holding a paper sample in your hand,' says Boatright. As a major supporter of the research projects underway at RIT, Innova Art is the first paper manufacturer to have submitted its papers for testing. Visitors to the site can look at the brightness, contrast and colour of the same image printed onto Innova FibaPrintR White Gloss and Innova Smooth Cotton High White at three different levels of magnification and lighting angles. As other paper manufacturers submit their products for analysis, the site has the potential to become a one-stop resource for any paper user. Copyright 2010, Innova Digital Art. Rights reserved.